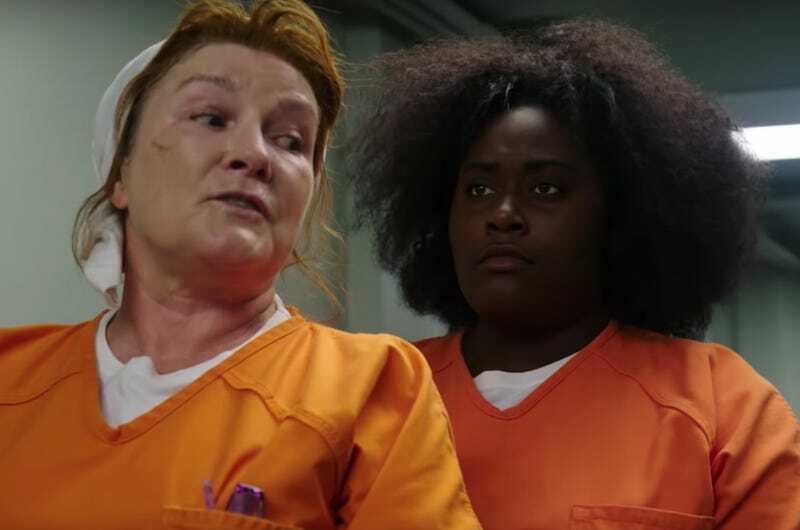 The first trailer for season six of Orange Is The New Black introduces the new, maximum-security normal for several Litchfield inmates, including Piper (Taylor Schilling), Taystee (Danielle Brooks), Suzanne (Uzo Aduba), and Red (Kate Mulgrew). Last season centered on the riot that followed Poussey’s (Samira Wiley) death, and though the timeline probably won’t be quite so condensed again, season six will deal with the outcome of the prisoner uprising. As government officials try to assign blame—that is, to anyone other than the department of corrections—Suzanne freaks out in their new digs until Piper tells her she’s lucky enough to be on the periphery of some ongoing conflict between women in khaki and women in blue. The Max facility is clearly going to take some getting used to, but don’t doubt the women’s resolve: as Red says, they have “iron wills” and nothing to lose. The season-five finale also saw the rest of the inmates shipped off to other prisons in the wake of the Litchfield riot, including Maritza (Diane Guerrero) and Flaca (Jackie Cruz), who [sob] are no longer together. Find out how they’re coping with their loss when Orange Is The New Black returns July 27 to Netflix.